We first read about the aquarium in the magazine “50 things to do”, which we picked up by chance at the airport museum. 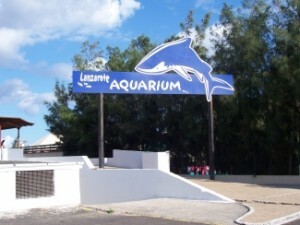 The aquarium is located in Costa Teguise and has an unspectacular entrance in a side road called Avenida de las Acacias (on some maps it is called “Calle de las Acacias”). Compared to many other attractions on the island, the entrance fee is quite expensive – with 12EUR for adults and 8EUR for children. Over 65s pay 10EUR, and there are discounts for residents. For 30EUR extra there is the option of a guided tour. The entrance hall is also the shop, and after a brief introduction you descend into the dark depths down a flight of steps. From here you follow the path along the 33 different aquaria – each containing different species of fish. The fish in each tank are described in English and Spanish on backlit panels. Larger panels telling the background story to the island’s development are in Spanish only. 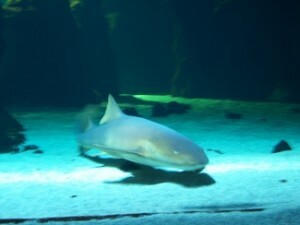 There are not only fish to be seen, but also seahorses, sharks and even stingrays. Apparently there are 1 million litres of water in total, with the largest tank containing 400,000 litres. In several places there are seats where you can sit and watch the beauty of the scene in front of you, accompanied by background music. Photography is encouraged, and with our daughter in full flow we ended up with over 400 photographs, however the use of flash photography is strictly prohibited. We took about 90 minutes to make our way from start to finish, and spent another 30 minutes sitting in front of the last tank watching the stingray and the sharks. During this time, the background music did get a bit repetitive! At the end you re-ascend into the shop via another flight of stairs. What we liked: it was not very crowded, so we were able to get a good view of the fish and take our time. Toilets are located at the end of the passage near the big aquarium. For fans of “Finding Nemo” there are many of the fishes featured in the tanks for children to recognise. A small amount of free parking is available in front of the entrance, otherwise in the surrounding roads. What could be better: although the staff speak German, none of the signs are in that language. Some of the windows to look into the tanks are too high up for smaller children. Was it worth it? Going as a family can be expensive, and it is fairly obvious that most of the investment has been made in the fish and their tanks and less in the rest of the building. Given that a family of 4 is going to be paying about 40EUR just to get in, it would be nice if there was the option of joining a guided tour without paying extra for it. After blogging about the stingray in Puerto del Carmen harbour yesterday, I decided to take a look on YouTube to see if I could find a video of one jumping as had been reported. In fact, I found that video amazing to watch as it is just so calm and the stingray doesn’t appear to be bothered by the diver swimming along behind it. One of the fascinating things to do after a meal in Puerto del Carmen is to take a walk to the harbour. 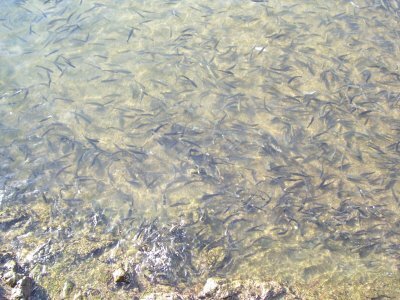 Here, you will see masses of small fish. If you throw them some scraps of bread, then they will not only fight over it, they will even jump out of the water in the process. It might almost seem as if these fish spend their entire lives in the harbour, waiting to be fed. This fact has not gone unnoticed, and every now and then a stingray comes into the harbour to feed on the fish. Until now I considered myself lucky if I caught a glimpse of it. Now, I know that stingrays can be dangerous because of their barb, but I thought that I was quite safe standing on the harbour wall. That way, until I read this article on the BBC News website. A stingray swimming off the Florida Keys jumped out of the water and onto a boat, killing someone in the process. Apparently, this is not the first time that one has jumped out of the water and into a boat, and I immediately thought back to the one I had seen in Puerto del Carmen.